Prior to creating the lexicon of Cubism, Picasso and Braque began an exploration of collage. One of the things that distinguished Picasso from Braque in that art form was Picasso’s use of the print medium, generally in the form of newspaper headlines that were made clearly distinguishable from the other objects that littered his canvas. Half a century later, along comes a poet whose visual art training makes her aware of both this period of art history as well as the developments of the de Campos brothers, Eugen Gomringer, bp Nichol, and Steve McCaffrey in the sphere of concrete poetry. Combining collage and visual poetics with the concept of marginalia, she creates a new form of poetry. Why is there so much interest in a writer whose works are so difficult to fathom? Perhaps it’s just that. They present a challenge to the reader who has grown tired of the usual fluff that passes itself off as literature these days. 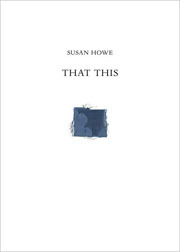 In the process, the works of Susan Howe extend our concept of what poetry (and writing in general) is, creating new dimensions, new problematics and techniques to be understood and mastered by the adventurous writer. 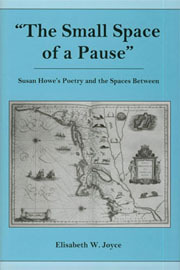 And thanks to Will Montgomery’s new book The Poetry of Susan Howe, the reader can gain new insights into Howe’s work. a book about books—books cited, inscribed, inherited, and loved. It is stylistically diverse, combining literary speculations, memoir, lyric poetry, and photography. . . . The Scare Quotes sections are built around the editions of Yeats, Stevenson, and others that Howe inherited from her mother and her mother’s brother. Although the lyric "I" was anathema to many of Howe’s contemporaries among language writers—the "guard", if anything, of the specious claim to coherence of the poem’s speaking subject—for Howe, despite the polyphony of her writing, the I appears to guarantee an ethics of poetic "vision". The I is, in this view, not identical with the speaking subject. It is a notional, quasi-divine absence that serves to underwrite the poem by preserving the strangeness of poetic speech. There is, then, a more profound ambivalence toward an institutional acquisition of knowledge that is thought to be aligned with patriarchy . . . On one hand, archives are considered to prolong the hegemony of those who guard America’s cultural heritage; on the other, they are places in which to get ecstatically lost, the sources of wild, "out-of-the-way" knowledge that might undermine that patrimony. 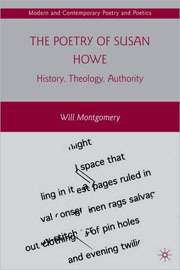 The two major serial poems of Singularities—Articulation of Sound Forms in Time and Thorow—show Howe wrestling into being a form of poetic speech that is adequate to a constellation of issues involving the archive, the transplantation of the Western tradition to another territory, femininity, and power. . . .
. . . For many observers, their representation, through a language of rupture, of the underside of American colonial history has rendered them exemplary among Howe’s poems. Throughout a long and distinguished career, numerous themes have interested Howe, the strands of which she has woven into a tapestry. 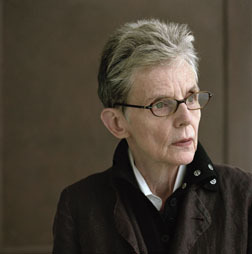 In The Poetry of Susan Howe, it is evident that Montgomery has done an amazing amount of research regarding Howe’s career and writings; the pages are peppered with numerous quotations from her writing and from interviews with her. His analysis is also exceptional, making this a book full of insight into a “difficult” poet. 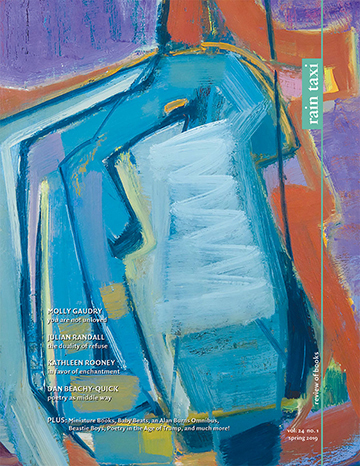 Elizabeth W. Joyce takes a different approach to this difficult poet inThe Small Space of a Pause, examining Howe’s interaction with what Deleuze and Guattari have termed the “third space,” i.e. “the silences of history, the margins of the page, the placeless migrants, and the uncharted lands.” But there is something else—much more, in fact. Anything that can aid in understanding the work of a major contemporary poet is highly valuable, and this book does just that. For Jonathan and Sarah all rivers run into the sea yet the sea is not full, so in general there is always progress as in the revolution of a wheel and each soul comes upon the call of God in his word. I read words but don’t hear God in them. Howe’s refuge is in writing, and she creates stunning lines such as “Your head was heavy as marble against the liberty of life.” For Howe, prose is a generic term and she does not shy away from the inclusion of a dictionary entry, an autopsy report, a letter. Here as elsewhere she reveals herself as an expert at collage, deftly assembling disparate materials. Later, Howe incorporates a technological description of the Beinecke Rare Book and Manuscript Library “one of the largest buildings in the world devoted entirely to rare books and manuscripts” which was “constructed from Vermont marble and granite, bronze and glass.” Reminiscent of Marianne Moore, this reads like a brochure extolling the virtues of this building, with its “state-of-the-art North Light HID Copy Light system.” This is followed by a description of “Hannah Edwards remembering her delirium during an illness in 1736,” giving us a panoramic view of time, a view which stretches as far back as Ovid’s Metamorphoses and Pyramus and Thisbe. The next section is called “Frolic Architecture,” and we are greeted by a transcendental Emerson epigraph. Howe provides fair warning of what we are about to encounter: “this book is a history of / a shadow that is a shadow . . .” Here we enter the realm of “writing through” which experimenters such as Jackson Mac Low did before Howe, although she has become justly famed for having explored this method’s reach. Essentially, she takes a piece of writing—hers or somebody else’s—and places across it something opaque so that part of that writing is obscured, copying only the writing showing through. On occasion she intersperses what appear to be photographs that mimic the remainder (or vice versa). Is it accidental that “tho melancholy was yet in a quiet frame” appears within a square block? On that the words “I was in, it was not without a deep” appear as a visible phrase on the next line? Howe originally being a visual artist prior to turning to poetry, is this process, for her, a development of concrete poetry? Meaning appears on the edge of consciousness, unable to break through. This is Howe’s magic—to make you, the reader, reach for something you feel is there, and to keep you returning to the page in hopes that, at some point, the boundary will be breached.